My dad once told me a story from the early days of my parents’ marriage, while they were still living in New Orleans, of attending a Saints game at Tulane Stadium in 1970. The Detroit Lions scored to go up 17-16 with under a minute left, and with a long way for the Saints to go and not much time (and for the fact that they were 1-5-1 going into the game), they decided it was unlikely the Saints would find a comeback, and they left early to beat the traffic. DEMPSEY KICKED A FIELD GOAL! Dempsey kicked a field goal! The Saints win! He didn’t say it in so many words, but I took the right lesson. Never leave early. What’s a little extra time in traffic compared to being present for a historical moment? If you watched the Saints game on Sunday, you probably know where this is going already. I watched the game from section 605 of the Superdome, with an old friend who drove with me from Houston to the game. 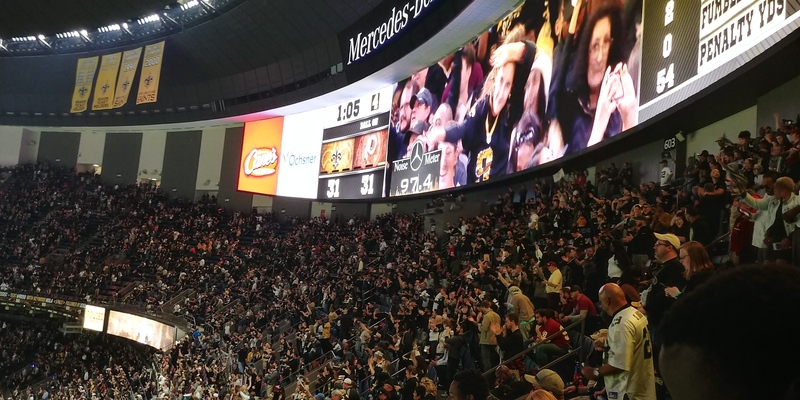 When Washington scored with 5:58 left in the game to take a 31-16 lead on the Saints (on New Orleans’ third blown coverage leaving a receiver wide open in or on the way to the end zone), a lot of people in our section left. (Though not, it should be noted, a young man in a Kirk Cousins jersey who became increasingly cocky over the course of the fourth quarter to this point.) We talked about what to do. When I came out, he was standing nearby watching on a TV at one of the food stands. “They didn’t even onside! They went deep!” With only two timeouts and the two-minute warning ahead, the Saints couldn’t give up a single first down, or the game would be over. A precarious situation for a defense that, missing three starters, had not played today nearly up to its typical level during the seven-game winning streak. We were both pretty disgusted with the decision to kick deep, but we decided “Eh, well, if Washington gets one first down the game is over. Let’s just watch from here to see if they do.” When it came up to third-and-inches, I mentally got myself ready to leave. They’d been getting run over all day; were they going to really get a stop here? But the Saints stuffed Samaje Perine in the backfield, and the two-minute warning came, with Washington preparing to punt. We decided to go back to our seats. On the first play, Drew Brees winds up to go deep, and delivers the ball directly to Kendall Fuller, covering Ted Ginn. So much for that comeback– but look. There’s a flag on the field. Fuller is called for an Illegal Use of Hands penalty, giving the Saints five yards, a first down, and another chance. 1:40 on the clock. You know what happens from there. On the next four plays, Brees moves the ball effortlessly. Washington’s defense suddenly seems gassed and out of sorts. Brees throws to four different receivers; none gain less than 17 yards. Alvin Kamara takes a route out of the backfield, and juggles the ball while nearly being hit by two defenders, but somehow slips through them and secures it, evading even more tackles on his way to the end zone. I worry that they’ve left Washington too much time, given how the defense is playing. And I might be right. Washington doesn’t take much time to march to the Saints’ 34 yard line, with about 30 seconds left. This would be a long, but not impossible, field goal for the win. But on first down, Kirk Cousins has a miscommunication and throws a ball to nobody at all. He’s whistled for intentional grounding– 10 yards and 10 seconds off the clock. The team is now out of field goal range, and will have to get back to it– and then either get out of bounds or get a spike in to stop the clock before it runs out; they have only 18 seconds left. None of that happens. The Saints send Vonn Bell on a blind-side blitz after Cousins, who never sees it coming. He fumbles on the sack. Washington offensive tackle Morgan Moses recovers the fumble, but it will be impossible for the team to run another play. We’re going to overtime. Washington’s defense had nothing left. It only took two plays to set up a chip-shot field goal, as Mark Ingram ran the ball first for 20 and then for 31 yards. Wil Lutz was good from 28, and the comeback was complete. Now the Superdome was rocking. We were high-fiving strangers, taking videos of a thunderous crowd that reached over 100 dB noise level. In a season that seems more serendipitous than ever– remember the last time the Saints completed a comeback against Washington that they shouldn’t have been able to?— the decision to see this particular game in person, of the eight Saints’ home games, certainly seems like one touched by fate. The last bit of fortune? Spotting fans wearing player jerseys outside of the stadium, always a favorite activity of mine to see both which old players are popular enough to have warranted jersey purchases, and seeing how odd or obscure the choices might be. 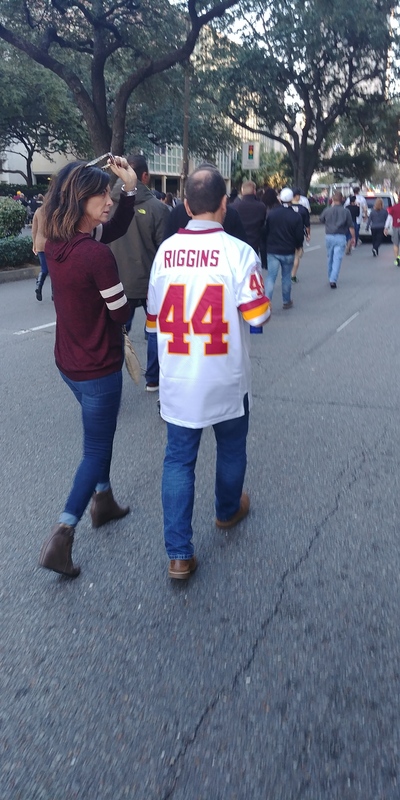 After seeing Washington fans sporting such classics as LaRon Landry, Sean Taylor, and Art Monk, I told my friend, “It would really make my day if I saw someone in a John Riggins jersey.” About ten seconds later, he pointed out a guy probably in his sixties in a white RIGGINS 44 jersey. I then said “It would really make my day if I found five hundred dollars on the sidewalk,” but I guess you can only push the power of divine intervention so far. Marshon Lattimore is really important to this defense (and A.J. Klein might be, too). Lattimore hurt his ankle breaking up a pass in the end zone on the first Washington drive. He missed the rest of the first half; he came out for one play in the second half, but had to leave again and would not return. With Delvin Breaux and Vaccaro injured, the secondary doesn’t have enough depth. If Lattimore, its best player, misses any significant time, this team might quickly turn back into the 2014-16 Saints for stretches. Klein had been the Saints’ leader in total tackles going into the game (he’s now tied for fourth), and while he hadn’t graded as well for the season on sites like PFF, his tackling was good enough that he could get consistent stops before players broke past him into the third level. Without him around, the frequency of missed tackles became much more apparent. Hopefully Klein returns soon; with Alex Anzalone already injured, the Saints can’t afford to be missing both of their projected every-down linebackers. And on top of that, Alex Okafor tore his Achilles late in the game. He’d been a surprising bright spot as a starting defensive end, not a top-tier pass rusher like Jordan but a consistent force as a secondary rusher and a frequent run-stopper and playmaker behind the line of scrimmage. He’ll be missed. Presumably, Trey Hendrickson will take his spot in the starting lineup; he has the athletic talent to be a player in the league for years to come, but we’ll see if his development is where it needs to be. The Saints have built a great defense this season, but they can’t afford to lose too many players to keep performing at that level– and they absolutely cannot afford to lose Cameron Jordan or Marshon Lattimore. The whispers of Drew Brees’ decline were highly exaggerated. Though the offense has become much more running back-heavy this season, and Brees is on pace for his lowest statistical output since arriving in New Orleans, he proved he can still deliver the goods when it matters. On the final two drives of regulation, Brees was an astounding 11-for-11 for 164 yards, throwing both of his touchdown passes on the day. Even if Washington was playing soft coverage for that first touchdown drive, there’s no reason they should have been carved up so easily and quickly on the second. 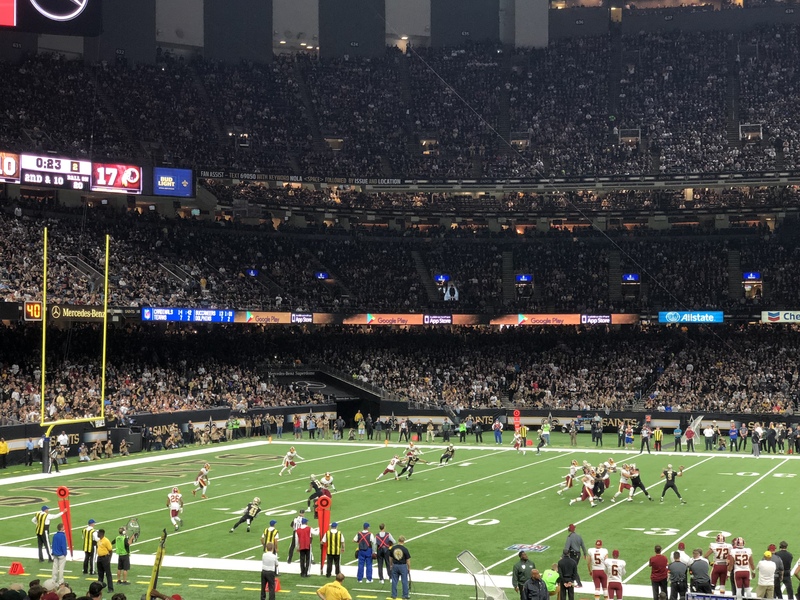 Everything was clicking: The playcalling, the receivers getting open, and Brees delivering passes that allowed them to gain significant yards after the catch. The offense didn’t switch to a focus on running backs because of any decline in Brees, as has been reported lately. It’s because the best Brees/Payton-era Saints teams always funneled a high percentage of their offense through running backs, whether it was Reggie Bush catching passes while Deuce McAllister and then Pierre Thomas ran the ball; Darren Sproles catching out of the backfield while Mark Ingram ran; or now, with Ingram and Alvin Kamara splitting duties. The Saints can win despite a number of boneheaded conservative decisions. I was appalled when Sean Payton punted on 4th and 3 from their own 43 while down 24-13 in the fourth quarter. I mentioned my disgust at not attempting an onside kick above. With the way the defense had been performing after Lattimore exited the game, I thought “trusting the defense” to get the stop the team needed was a mistake. Mathematically, I’m sure it was; I haven’t run any of these decisions by a fourth-down or win probability calculator, but years of studying the topic have, I think, given me the right instincts on when to go for it and when to kick the ball away. But it all worked out in the end. The Saints got every stop they needed, playing the last three drives of regulation, and all of overtime, to perfection. I just wish Payton had made some decisions so that they didn’t have to be perfect to win. The Saints have a serious test next week; even though the Rams lost to Minnesota, they’re still 7-3 and playing excellent all-around football. Sean McVay has completely turned the team around (and exposed what a joke NFL hiring practices are, given that Jeff Fisher was an NFL head coach for twenty years) and the early line has the Rams as 2.5 point favorites. If Lattimore is back, though, and Trey Hendrickson can provide a reasonable replacement for Alex Okafor’s production, the Saints could win this, which would be huge for their future playoff seeding. Philadelphia isn’t showing any signs of slowing down, but Minnesota’s upcoming schedule is tough, and the Vikings already have the tiebreaker on the Saints. A Saints win Sunday would not only give them a tiebreaker over the Rams, but would also prevent them from losing any ground to the Eagles and Vikings.